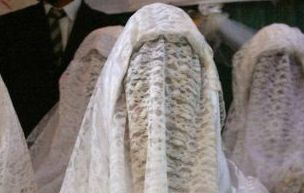 There’s much talk about whether or not the partial outlawing of the veil in France is justified or not …. well Im not going to blog about that, it’s been done and it’s old news. However this caught my beady eye in the news today ‘ Ambassador of Dubai’s marriage to a bearded lady is anulled’. It’s truly ‘a mans world’ when he advocates the wearing of the veil and then is legally allowed to anull his marriage because he didn’t like what he got! I can’t help but think serves him right and what an irony! The poor bride must be feeling pretty rejected although no one will recognise her anyway and how come she didn’t go to a beauty salon before her wedding? All sounds pretty illogical if you ask me….. after all it’s claimed she’s an educated woman, a physician no less and yet she didn’t de fuzz. It leaves me to assume she actually didn’t want this marriage in the first place…..I would hazard a bet that the disappointed groom is balding, fat and certainly no Adonis himself .